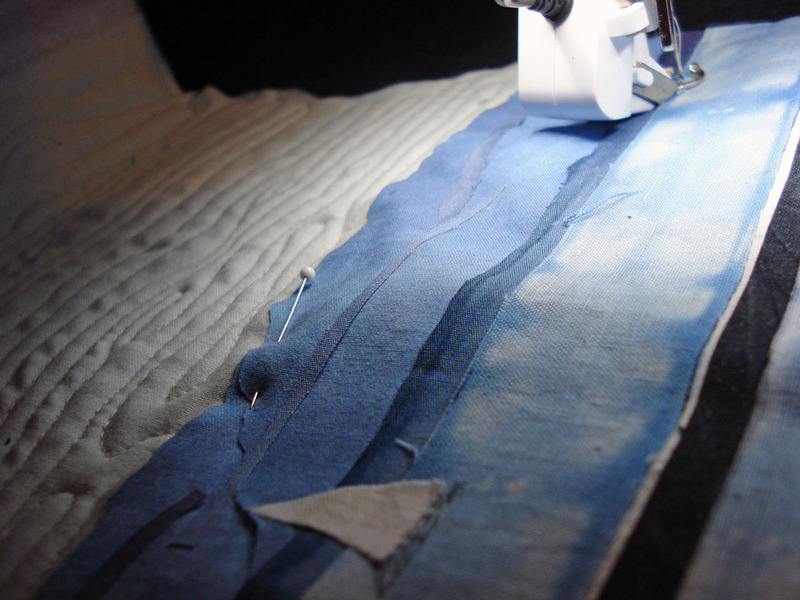 I’m happy with the final outcome of the water fabric for “Lake Washington”, and started free-hand machine quilting the sky and water (piers and background). 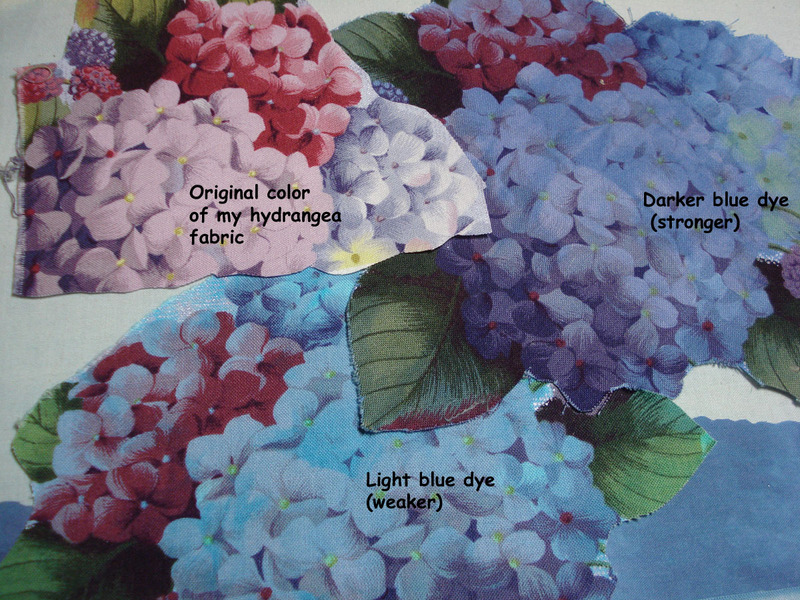 Not at all the color of the blue hydrangeas I love so much in the Seattle area! 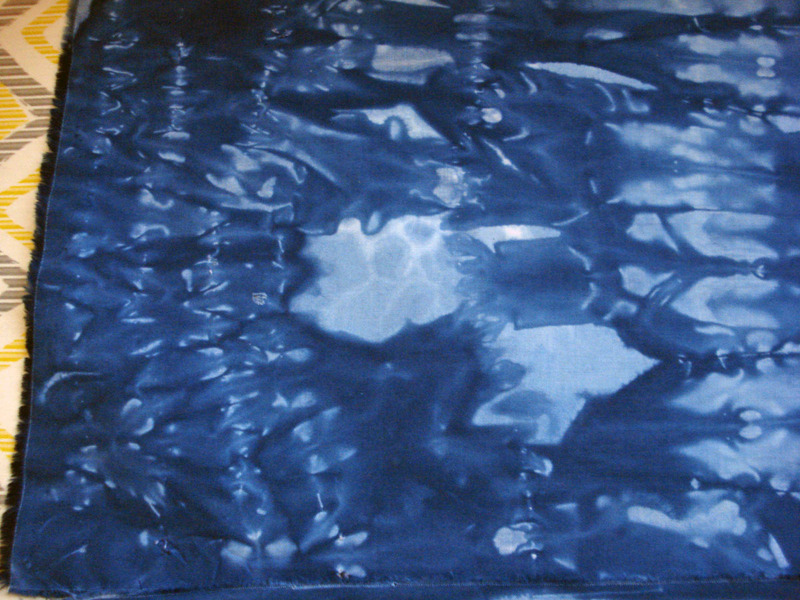 So…having blue dye still left over I decided to experiment by over-dying the fabric. 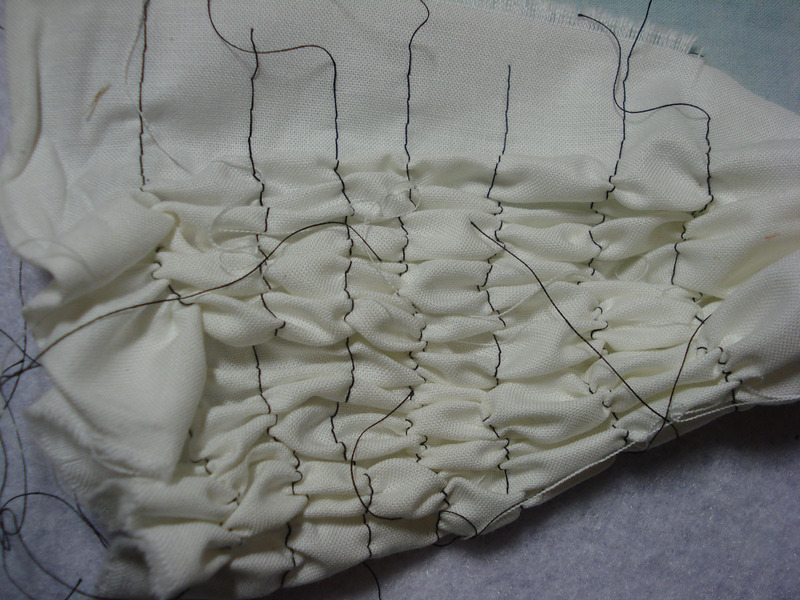 But here’s the final result–not quite final–but at least quilted and ready to bind. 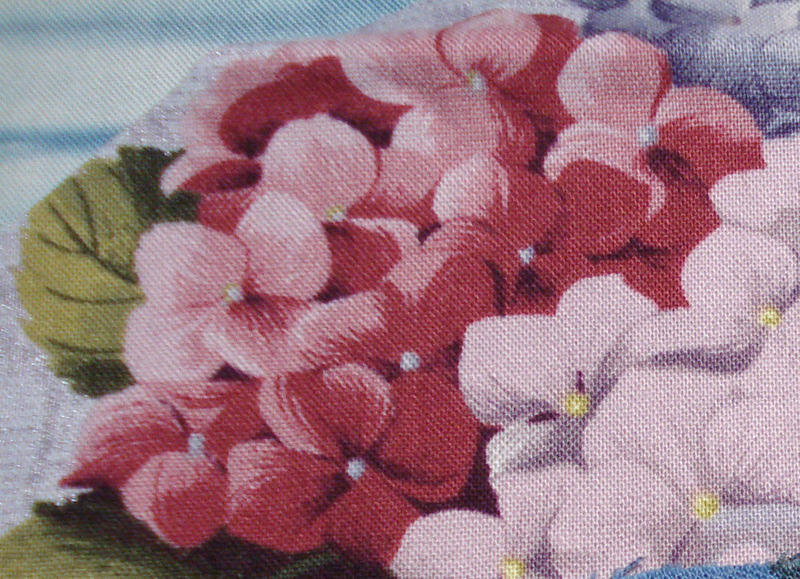 After the last few dying results not being exactly what I wanted, I thought I’d it try using a different preparation technique with each of two fabrics. 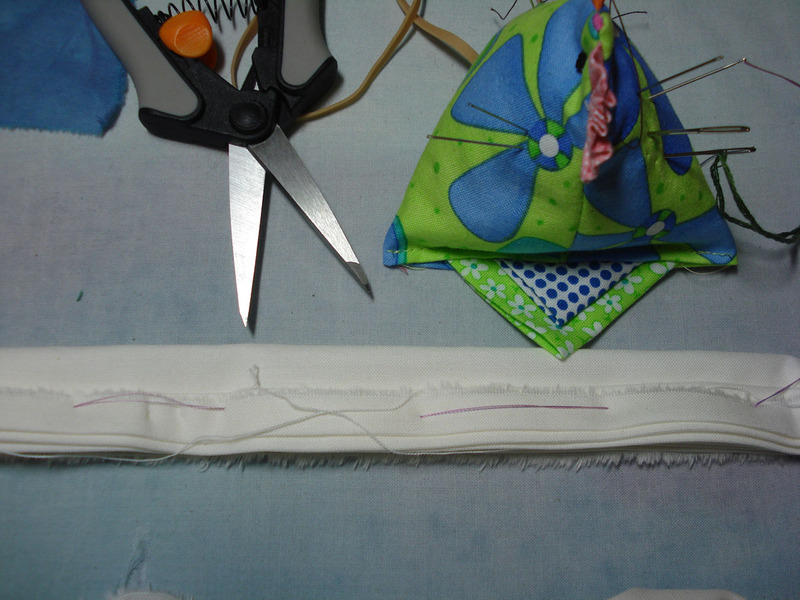 I neatly fan-folded a fat quarter of PFD cotton fabric, pressing each crease with my hot iron and then loosely hand tacked it all together with cotton thread and a loose running stitch). 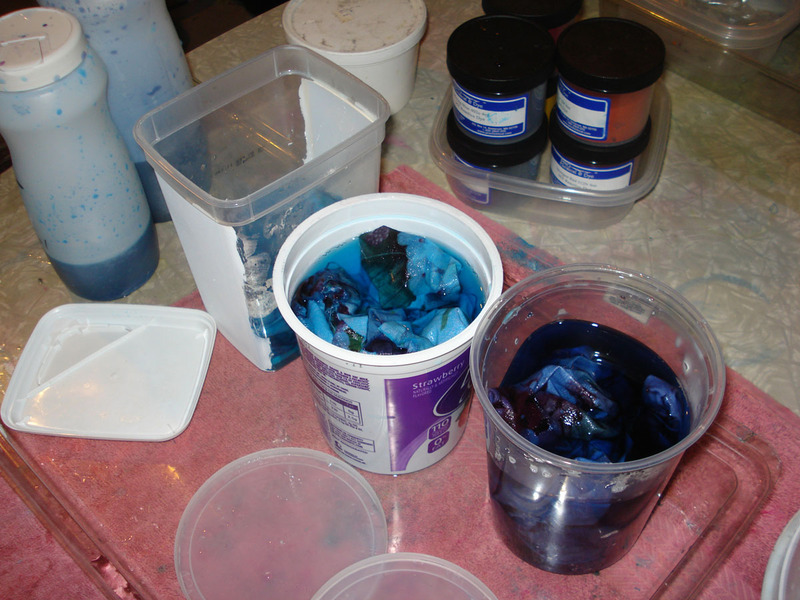 Using my Procion Dye mixed in hot water, and adding it to a soda ash/water solution, I put each fabric into a large plastic container and poured the dye mixture over them, letting them set for at least four hours. They’re interesting, but way too dark. And the gathering is very hard to get out. 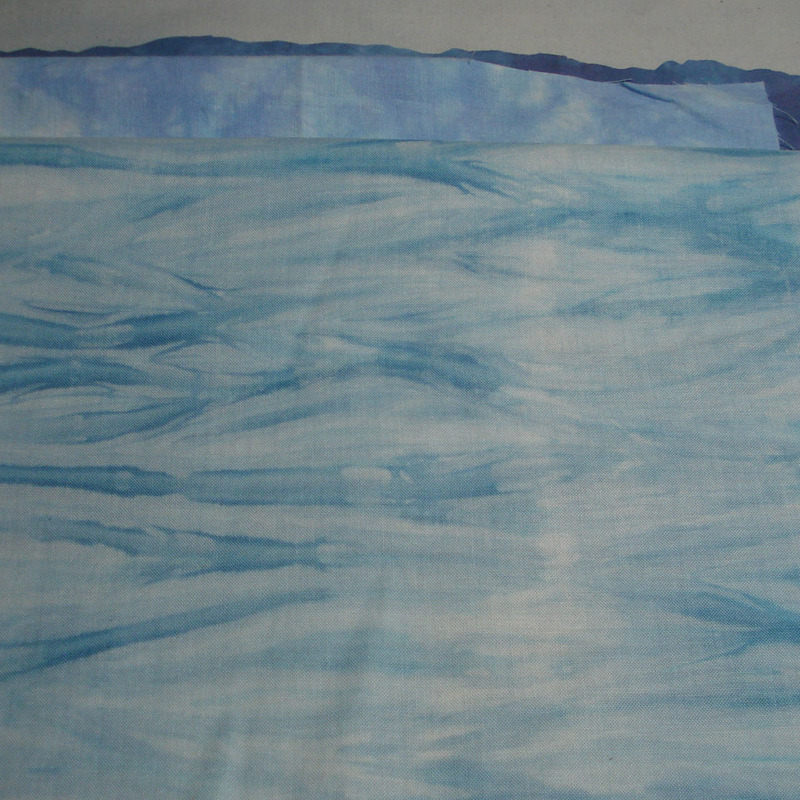 So I tried once again, using the folding technique–this time using rubber bands instead of tacking stitch–with a lighter dye bath (not so heavy on the blue dye powder). I’m starting a new art quilt. 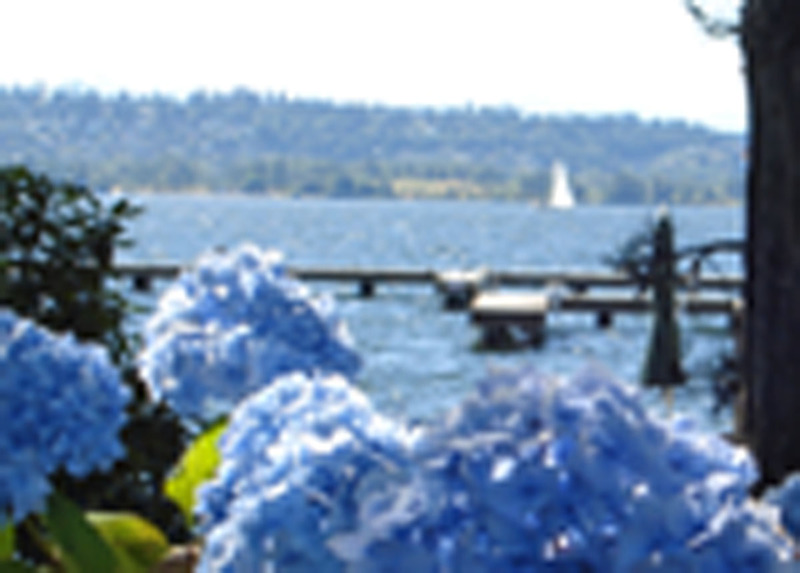 A few years ago, while visiting my son in Seattle, I just happened to snap a photo of Lake Washington with bright blue hydrangea in full bloom in the foreground. 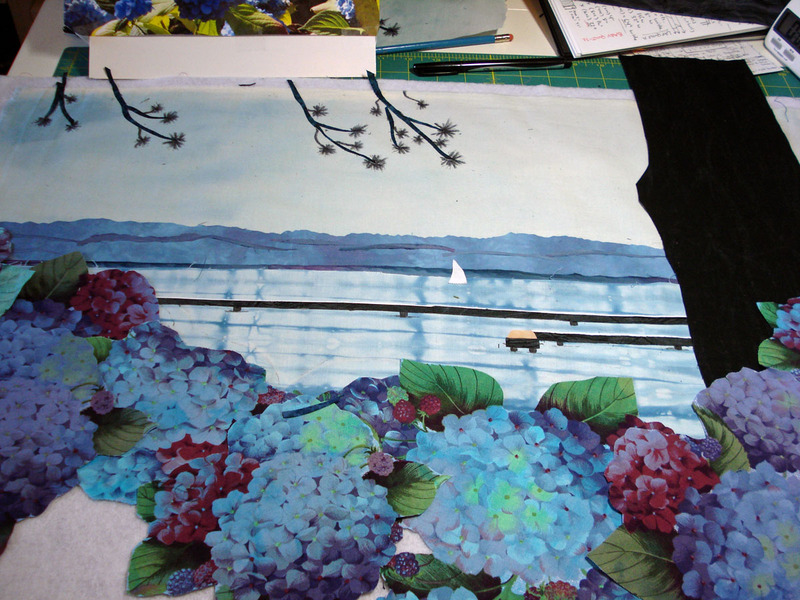 I’ve always wanted to make a landscape quilt from the photo, but I’m not quite sure how I’m going to go about it. I’ve procrastinated for quite awhile! After hearing from a fellow quilter that she felt art quilts were easier than pieced quilts because you can always cover your mistakes, I took heart and decided to jump in and go ahead and see what happens. If it fails it fails. 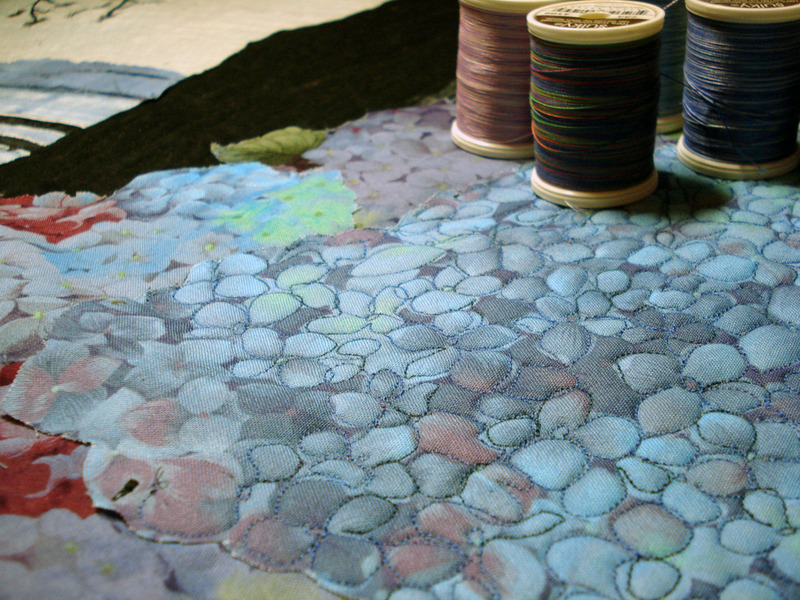 After pulling every hand-dyed and batik fabric I have (what a mess! ), I was ready to start. 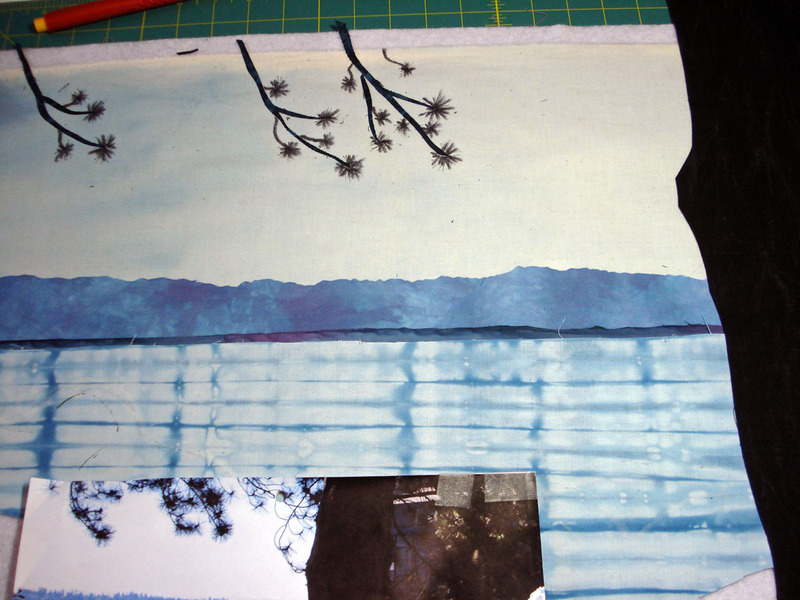 I found a pretty good sky fabric, something that might make do for the shoreline in the distance, and lots of hand dyes for the flowers, but the lake water had me stumped. Nothing seemed right. 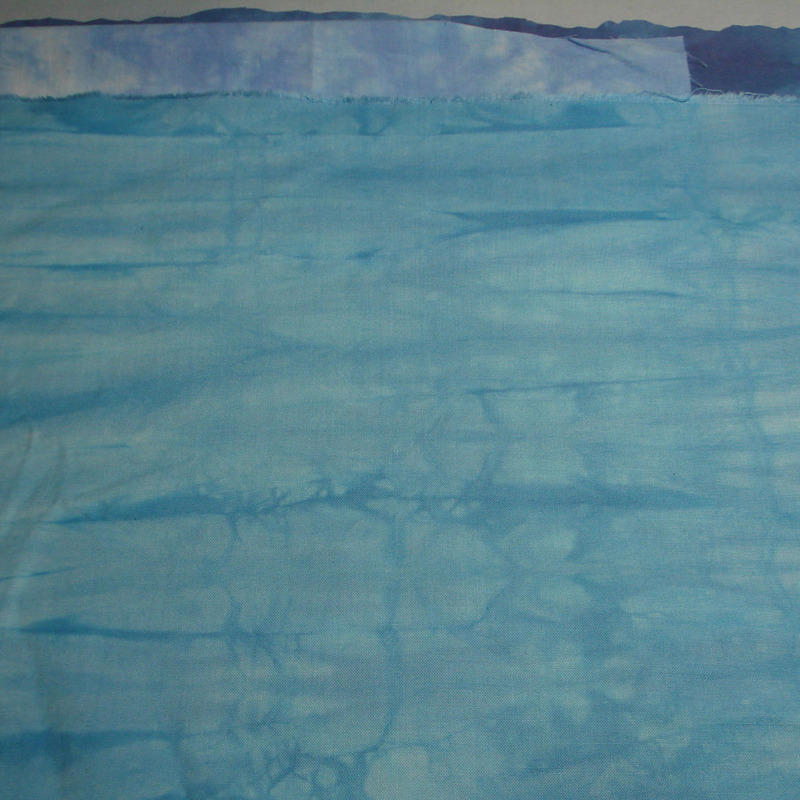 So late last night, I cut about a yard of my Kona PFD fabric and headed downstairs to see what I could come up with. The first two pieces I tried were soaked in soda ash solution and placed (ringing wet) on the bottom of a large plastic pan. I tried to “pinch” them into horizontal folds. I mixed up two solutions of Procion Dye powder (two different blues) with hot water, and poured a little of each into the pan. 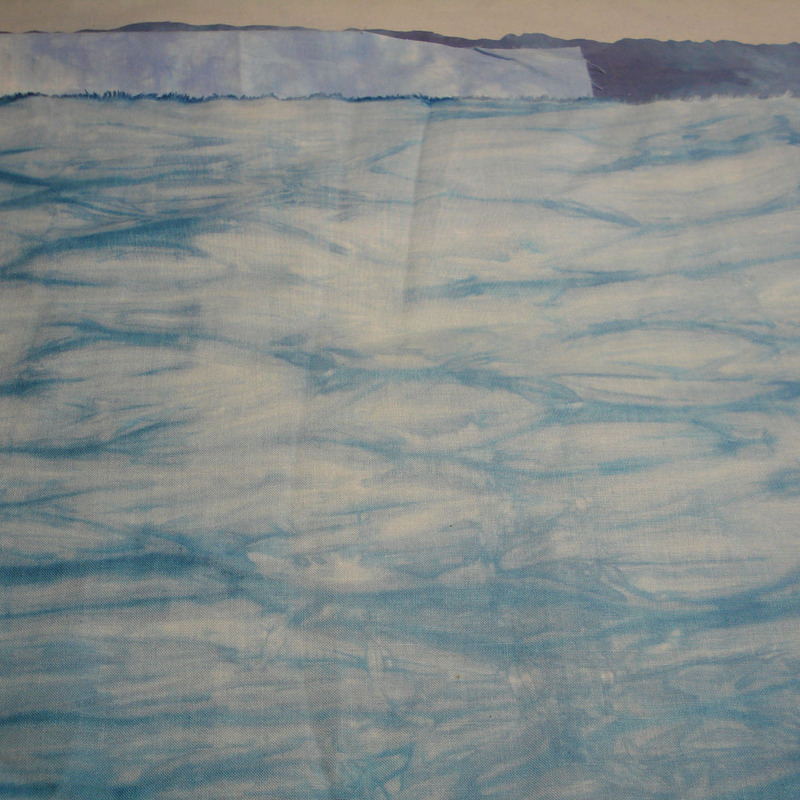 This allowed the dyes to “soak in” to the bottom of the fabric, leaving some lighter areas on top– hoping to replicate the light and shadow of rippling water. After a few minutes, I swirled them into circles (like 2 cinnamon buns), picked them up & put each in a pint size wide mouth canning jar to sit for several hours. 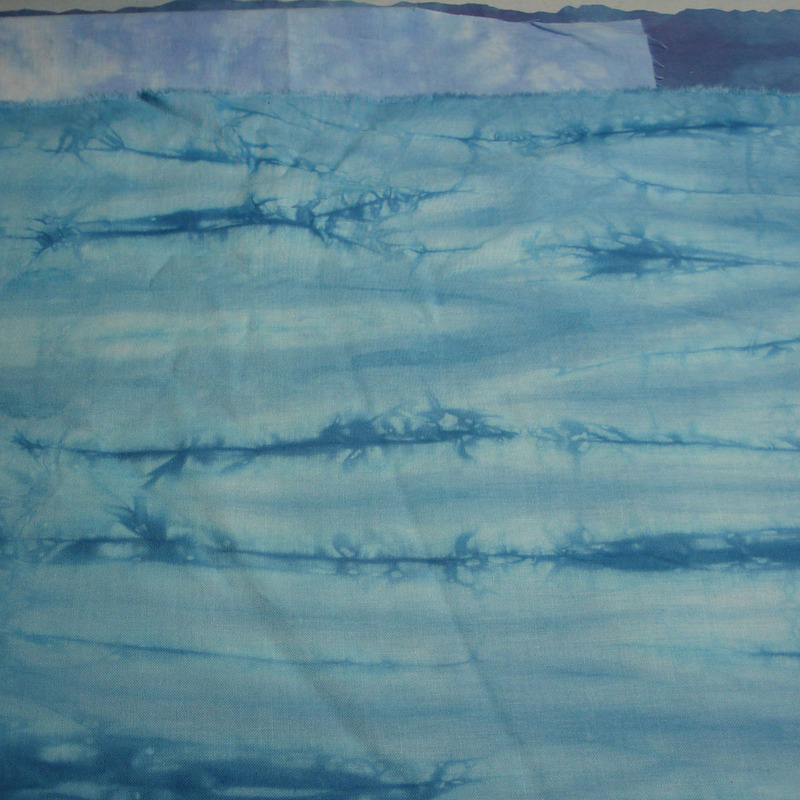 I wasn’t convinced that there were enough “ripples”, and the color was a bit more on the aqua side than I wanted. So I gave it another try. The lines are more pronounced–but still not exactly as I had hoped. 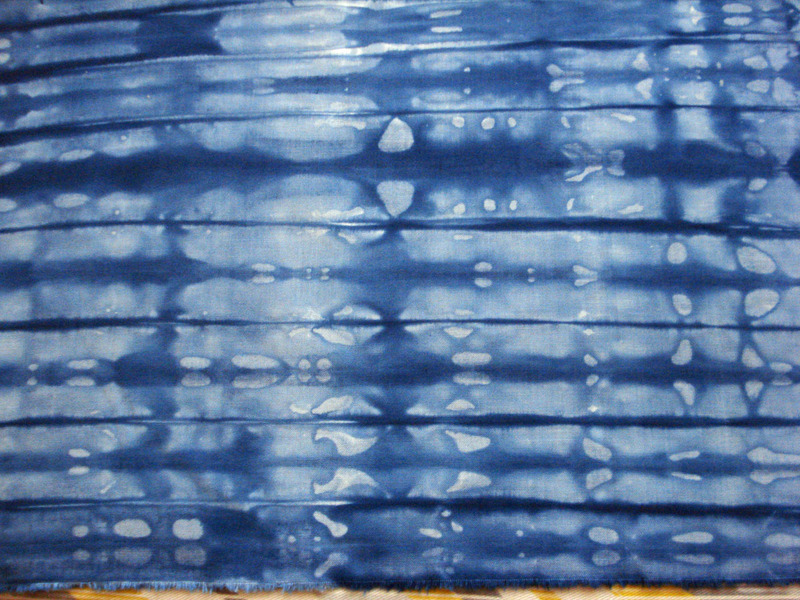 I love the process of dyeing fabrics, and have been dyeing cotton fabrics for years using Procion Dye. 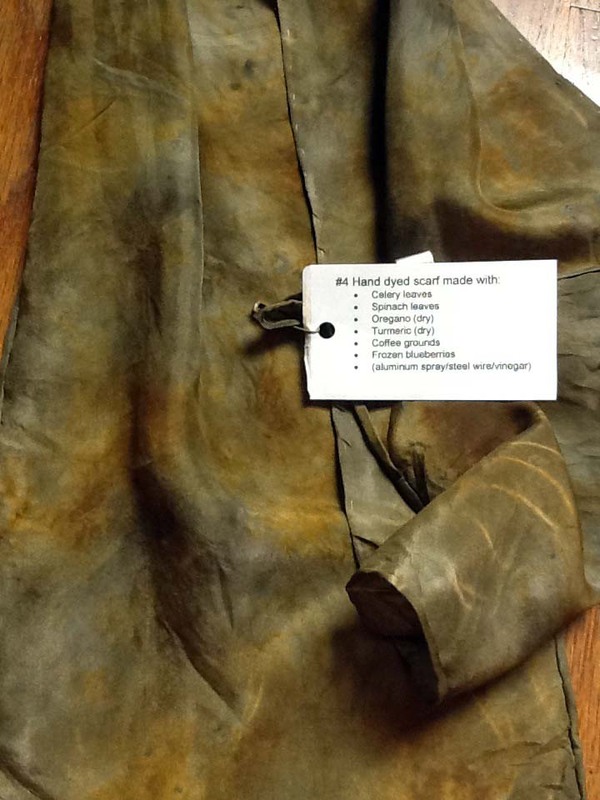 So a couple years ago when some beautiful scarves caught my eye at a gift shop and I found out that they were made using natural plant materials, I knew I had to find out more. I immediately searched for a class, and found one at Ohlbrich Gardens here in Madison taught by the talented and informative Shelly Ryan (The Wisconsin Gardener from PBS)–see this link for an even better tutorial! If you get the chance, sign up for a class with her–she’s an amazing person! We made several scarves that day. I’ve recently gotten back into it, after being asked to teach a little workshop for a few friends. I hope you’ll give it a try as well…here’s how. 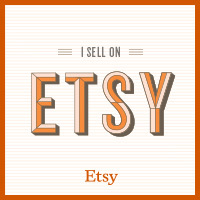 First, I purchased 100% silk scarves through Dharma Trading Company made especially for dying. They have many styles and sizes to choose from. The ones I used were “Habati 8mm hand rolled China 100% Silk”. 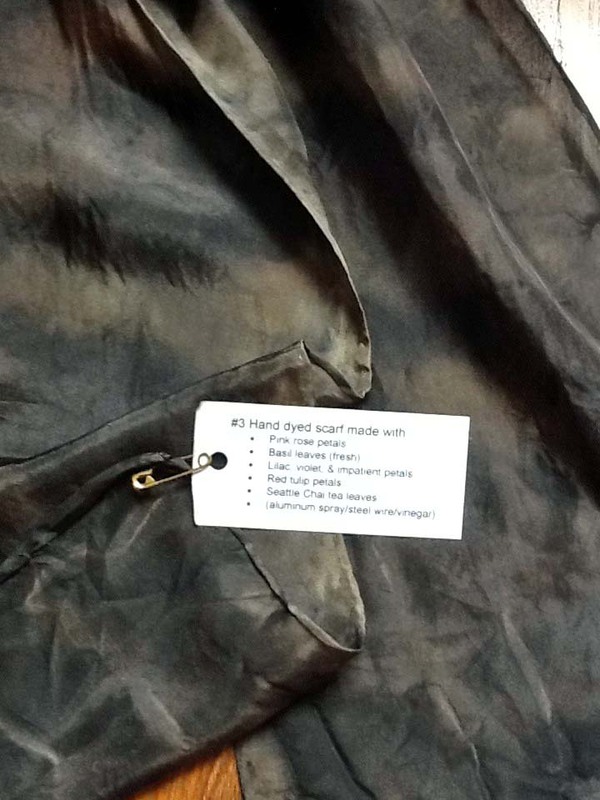 The protein-based silk fiber takes the plant dye beautifully, but is durable enough to stand up to the process. 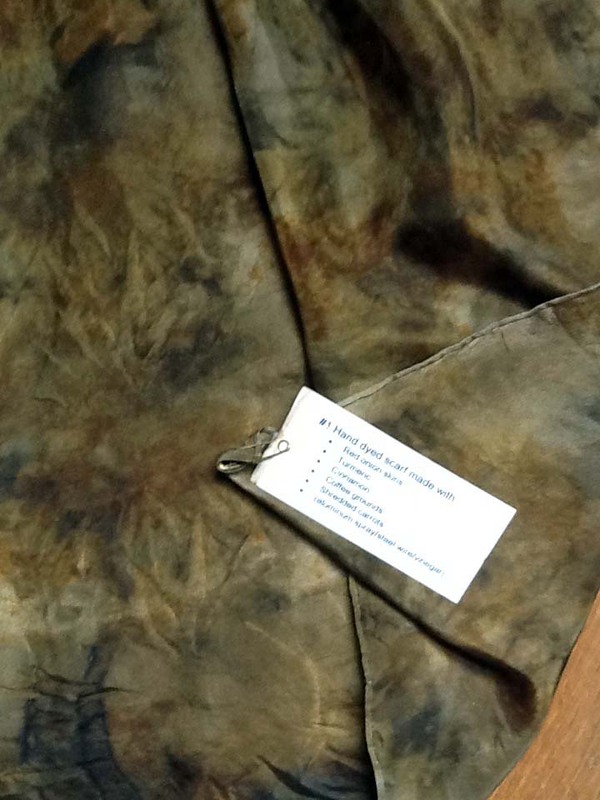 Dye–plant material. 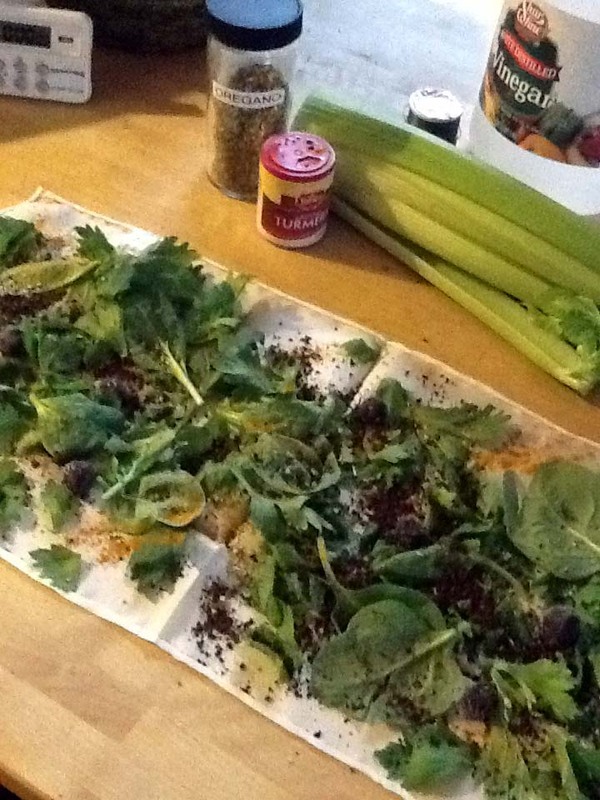 You can use everything from flower petals, to leaves and ferns, to weeds; search your kitchen scraps for carrot peelings, red cabbage, onion skins, avacado; or your herbs and spice cabinets for tumeric, cinnamon, tea leaves; or even coffee grounds. The sky’s the limit! 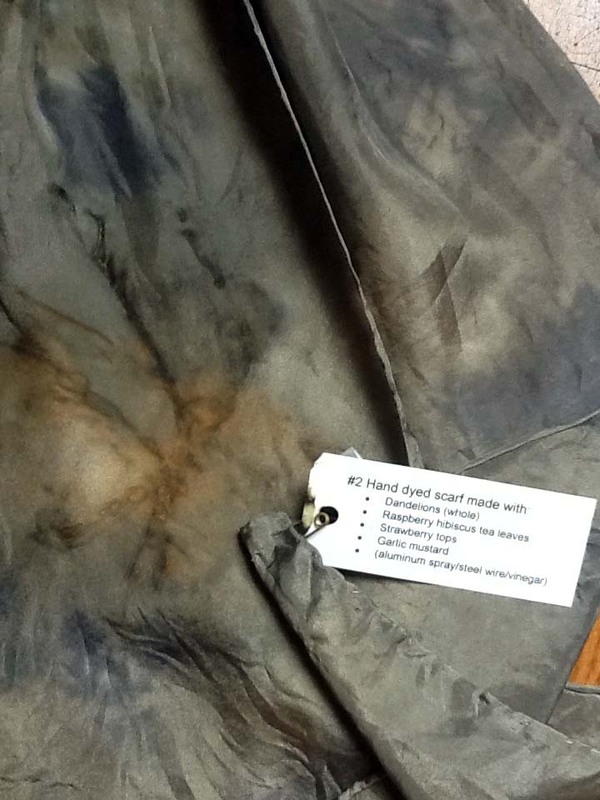 Mordant–to bond the color to the fiber, you’ll need to have on hand either steel wire, copper wire, even a penny will work, or a spray deodorant that contains aluminum. Acid-based liquid–to release the color from the plants–vinegar (white or cider, doesn’t matter), wine, fruit juice. 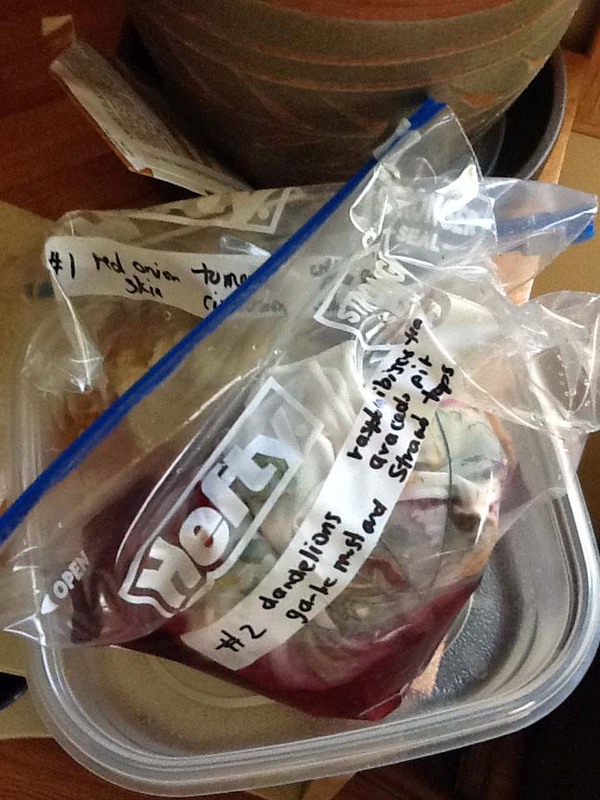 Also have on hand some sturdy plastic zip-lock bags (I used freezer quart-size), waterproof bowl or tray, rubber gloves, and a sharpie pen. 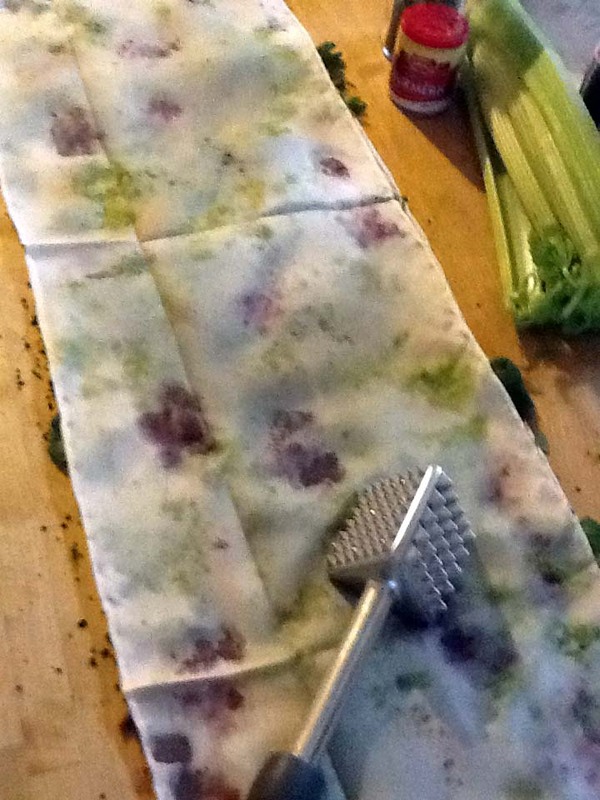 Lay the silk scarf on your work surface with half on the surface and half hanging off. (This is the point where you would spray it lightly with the deodorant before adding plant materials if you’re not using steel or copper.) Layer the plant materials on top of one half of the scarf in any way you choose–you don’t need to worry about covering every square inch–just have fun. There’s no wrong way! Experiment! Use one or two things, or pile on a bunch of different things. 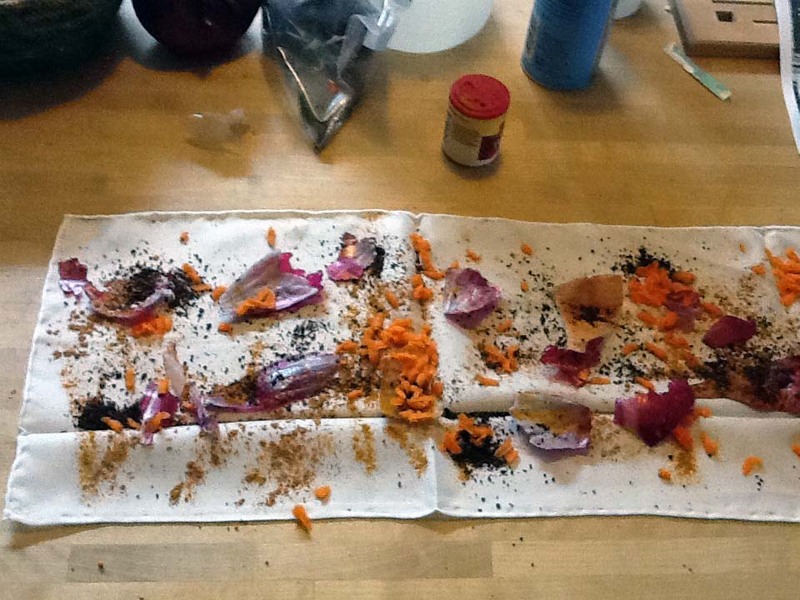 My scarf (in photo) had red onion skins, turmeric (spice), cinnamon, coffee grounds, & shredded carrots on it! Fold the other half of the scarf on top of first half and from one short end start rolling it; then make it into a ball (or roll again like a cinnamon bun) and secure with the steel or copper wire. (Be sure the steel wire is not galvanized–we want it to “rust”.) 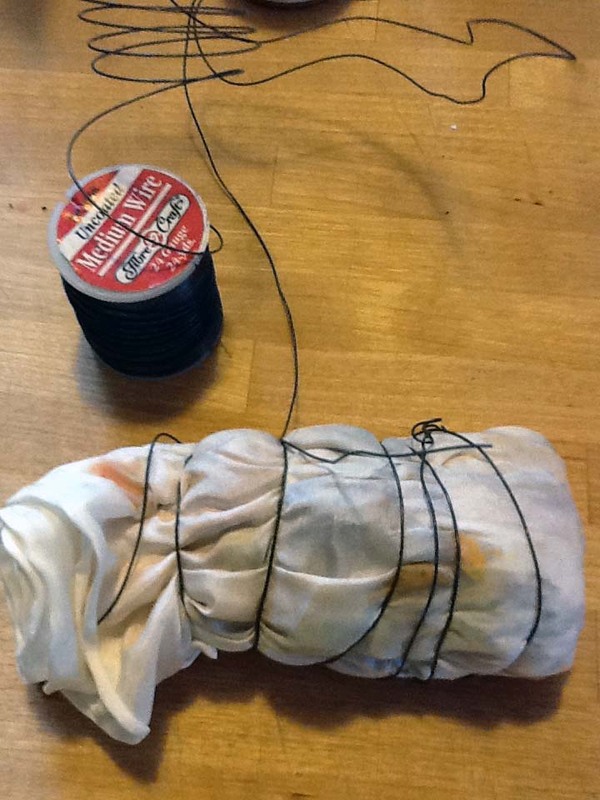 If you used the deodorant spray earlier instead or the wire, you can use yarn or string to tie. You might want to write on your baggie with the sharpie pen what plant materials you used, in case you’re keeping track. 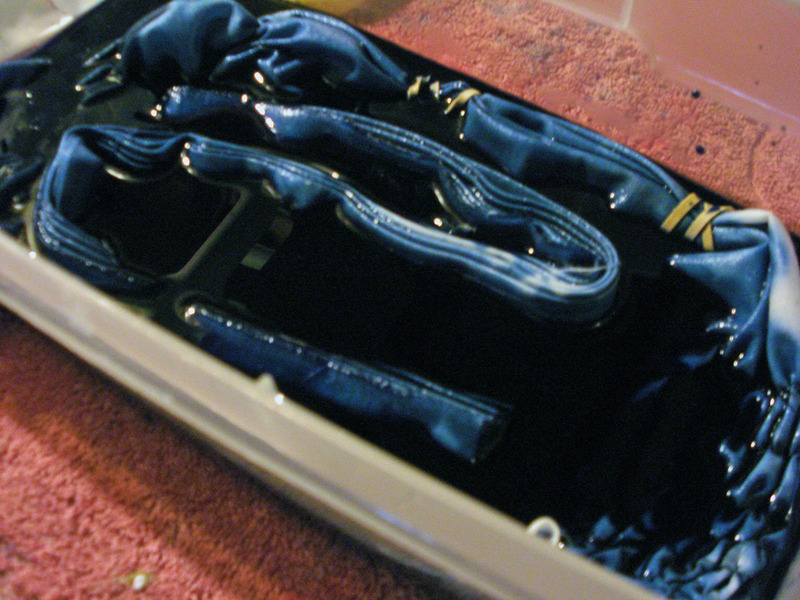 Then place the scarf it in your baggie and add whatever acid-based liquid you want–I chose to use white vinegar, cheap & in my kitchen already. You only need 2-4 tablespoons! Just enough to thoroughly wet it. 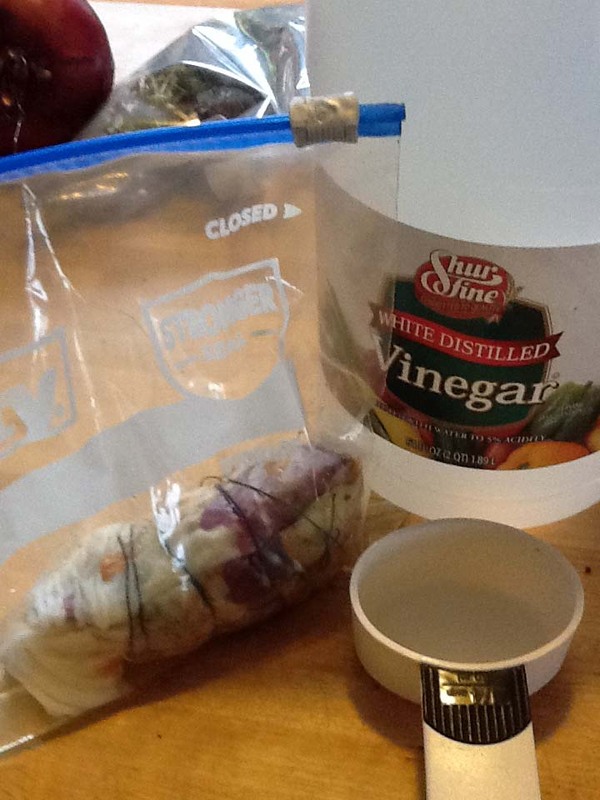 Then close up the baggie and place it in a waterproof bowl or other container–this is just a precaution, in case the bag should leak. 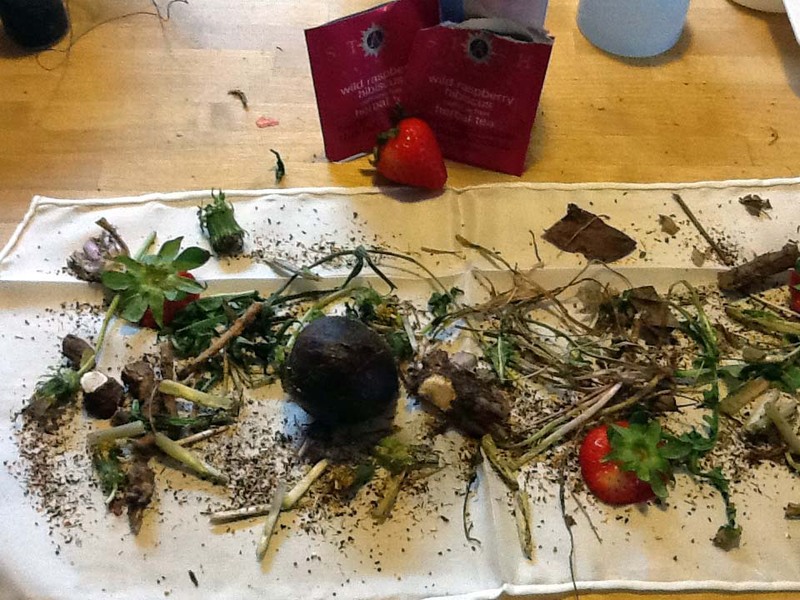 When the “reveal” day is here, put on your plastic gloves (the vinegar might be a bit irritating to your skin) and over a lined wastebasket, or outside in the yard, “pour out” any remaining vinegar & shake out all the plant material. Now take the scarf outside and hang it over a tree branch or bush (or clothesline) and let it dry out for a few hours. After the two weeks is up you can wash your scarf in warm water (I like to use my sink with a little Woolite or mild detergent) and rinse it thoroughly. 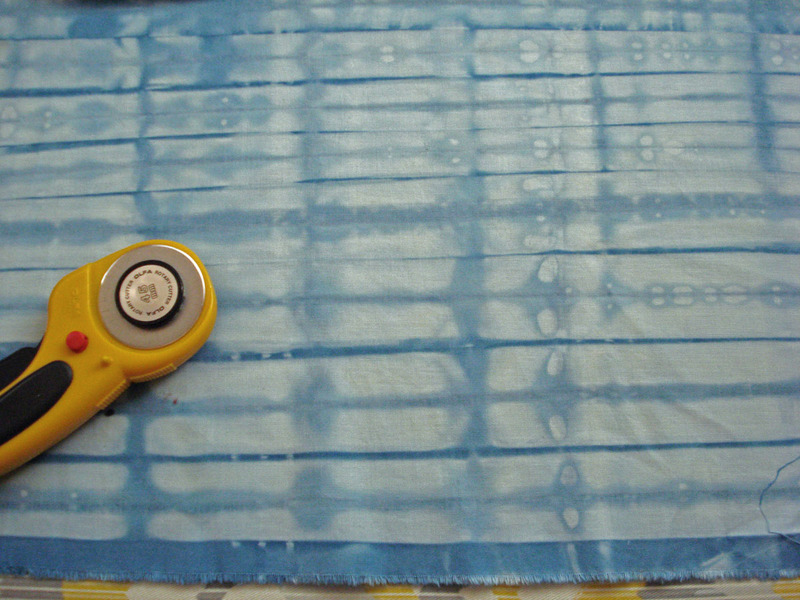 Then before it drys completely, iron it with a hot (silk setting) iron to set the color. That’s it! 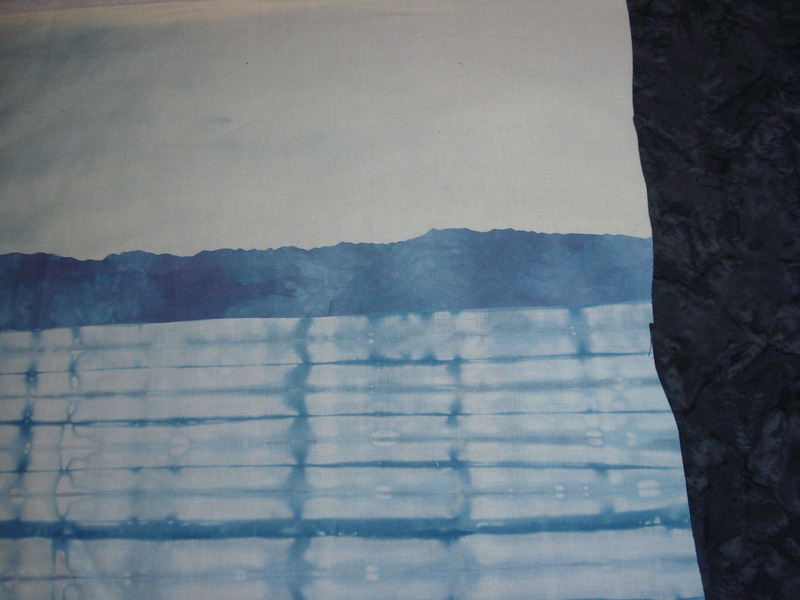 You have a beautiful hand-dyed scarf to wear or give as a gift. 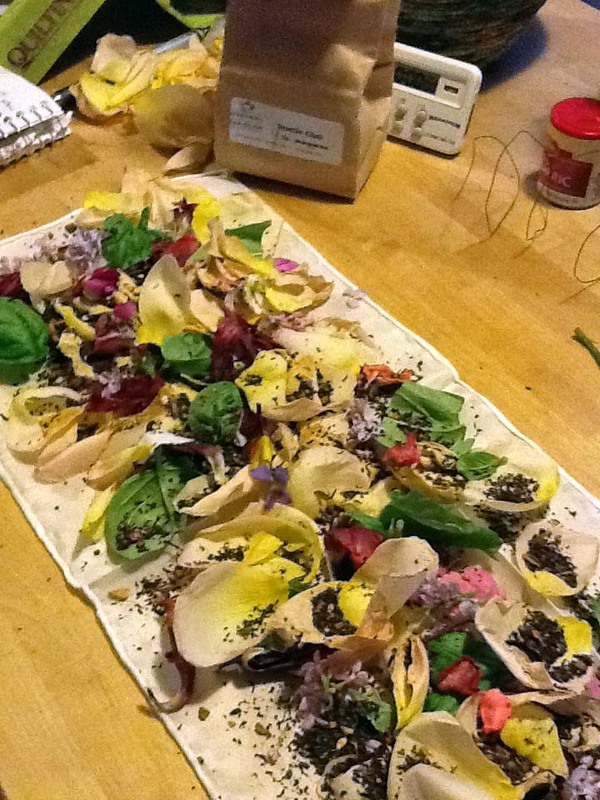 Here’s how the scarf turned out with the onion skins, etc. 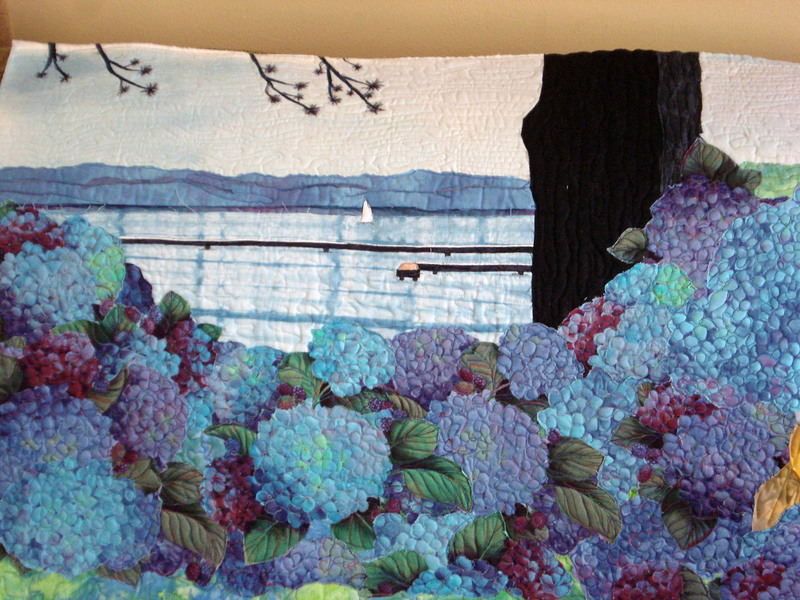 For more information, see Lauren Maple on PBS “Sewing with Nancy” segment.